The Aerosol Jet Print Engine enables next-generation product process development to factory floor production of 3D advanced packaging, sensors, and circuits used in smart mobiles devices, automotive, medical and other electronic products. 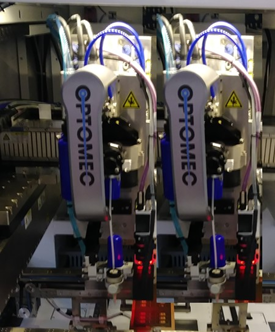 The Print Engine, with its advanced process controls and print cassettes, is Optomec’s most scalable and versatile printed electronics platform to date. With its scalable architecture up to two simultaneous printheads can be supported via a single process controller. Process controllers can be multiplexed together enabling up to four or more printheads in a single configuration to meet high volume production requirements. Aerosol Jet’s material deposition versatility enables it to meet a wide range of current and next-generation electronics manufacturing requirements across a broad range of industries. The Print Engine’s architecture facilitates custom and OEM automation platform integration. Aerosol Jet Print Engine integrated with production automation platform.